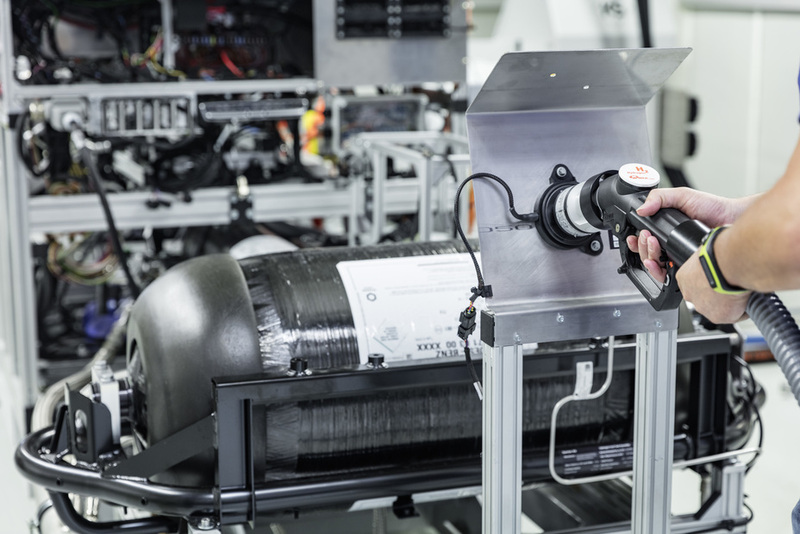 Fuel cell technology is an integral part of Daimler’s powertrain strategy. Mercedes-Benz has already gathered experience with hydrogen-powered electric vehicles over several vehicle generations. To date, the fleet of Daimler fuel cell vehicles, which together with a host of research vehicles numbers more than 300, has collectively covered nearly 18 million kilometres. The next generation of fuel cell vehicles from Mercedes-Benz is currently being developed based on the GLC. The pre-production vehicle of the Mercedes-Benz GLC F‑CELL, which will be displayed publicly for the first time at the IAA Frankfurt Motor Show in September 2017, combines the innovative fuel cell and battery technology into a plug-in hybrid. With it, Daimler substantiates its technology leadership and makes a statement within its CASE innovation strategy. Automobiles are initially developed on the computer. The first crash tests, aerodynamics analyses or chassis tests are also conducted in the virtual world using electronic simulations, long before the first prototype is built. After the first prototypes were roadworthy, the summer and winter road testing of the GLC F‑CELL began. The vehicles were driven on the proving grounds in Spain (IDIADA near Barcelona), Sweden (Arjeplog) and Germany (Boxberg), among others. The road tests also took the test teams to the Sierra Nevada (Spain) and the low mountain ranges of the Schwäbische Alb and the Black Forest in Germany. The test programme comprised more than 500 individual tests, which in addition to the standard test regimen for all vehicles also included special tests for the electric powertrain, the fuel cell, and the interplay of all powertrain components. The safety experts of Mercedes-Benz were able to build on almost 30 years of company experience with fuel cell vehicles. The special attention of the engineers in the development of the F‑CELL variant of the GLC launched in 2015 was directed to the integration of the safety-relevant components such as the hydrogen tanks, the gas seals and valves, and the high-voltage components. The development of the fuel cell powertrain began already in the 1980s. Back then, Daimler researchers for the first time studied cold combustion – the generation of electricity through the reaction of hydrogen with oxygen in a fuel cell. As a pioneer, Mercedes-Benz unveiled the first fuel-cell vehicle to the global public in 1994 – the NECAR 1. Many more vehicles followed, including the A‑Class F‑CELL test fleet (2003). The Citaro FuelCELL Hybrid urban bus has covered a distance of more than five million kilometres in line service since 2003. In 2011, special attention focused on the F‑CELL World Drive, the first round-the-world journey in fuel cell vehicles. During this event, three B‑Class F‑CELL vehicles drove more about 30,000 kilometres in 14 countries over the course of 125 days. In all, 200 vehicles were built. They completed more than ten million kilometres in customer hands and were refuelled 36,000 times during this period. After a total of more than 18 million kilometres across all vehicles from the NECAR to the GLC-based electric vehicle with fuel cell, the developers of Daimler and Mercedes-Benz consequently know what matters. The powertrain system has proven its market maturity.